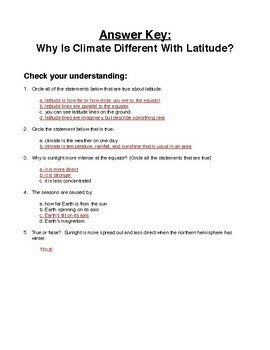 Why Is Climate Different with Latitude? Climate is different at the equator because the sun's rays are more direct. At the equator, there are no real seasons. As latitude changes and we go north or south away from the equator, we begin to have seasons. These seasons will be different in temperature and amount of sunlight at different times of the year. 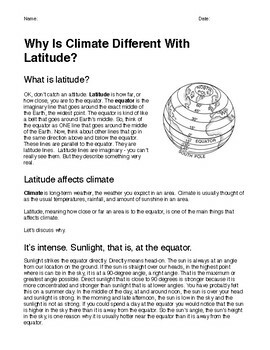 This reading discusses the basic concept that climate varies with latitude because of Earth's tilt and the way that sunlight strikes Earth's surface. 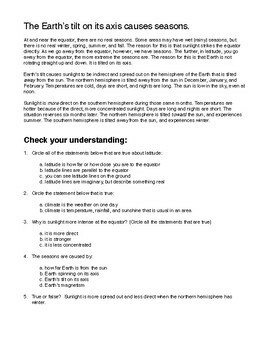 This reading would be best as homework or as a reading after the basic concepts of Earth's rotation, axis, and revolution around the sun have been taught and mastered. The primary purpose of the readung is to introduce the idea that latitude is one of the primary causes of geographic variations in climate. Designed to be read at the 7/8 grade level.